The cholesterol controversy is one of those highly topical areas of modern health care sector. All health issues should have multiple treatment options and it's choice that enables health improvement. Medication may work, but my philosophy is to get to the underlying cause, as a Band-Aid approach isn't the best solution. LDL cholesterolis called “bad” cholesterol, because elevated levels of LDL cholesterol are associated with an increased risk of coronaryheart disease. LDL lipoprotein deposits cholesterol on the artery walls, causing the formation of a hard, thick substance called cholesterol plaque. Over time, cholesterol plaque causes thickening of the artery walls and narrowing of the arteries, a process called atherosclerosis. HDL cholesterolis called the “good cholesterol” because HDL cholesterol particles prevent atherosclerosis by extracting cholesterol from the artery walls and disposing of them through the liver. Thus, high levels of LDL cholesterol and low levels of HDL cholesterol (high LDL/HDL ratios) are risk factors for atherosclerosis, while low levels of LDL cholesterol and high level of HDL cholesterol (low LDL/HDL ratios) are desirable. High cholesterol is a serious condition that blocks blood flow in the arteries, which can damage the heart and cause strokes and heart attacks. As we gain more weight, cholesterol is becoming a bigger and bigger problem. 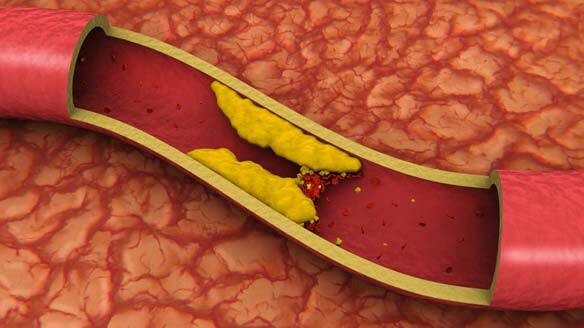 Naturopathic medicine is a natural alternative for managing high cholesterol. Can you burn off cholesterol? Cholesterol is a type of lipid, just as fats are. However, unlike fat, cholesterol can't be exercised off, sweated out or burned for energy. It is found only in animal products, including meat, chicken, fish, eggs, organ meats and high-fat dairy products. Just as homemade oil-and-vinegar dressing separates into a watery pool with a fat-slick topping, so would fats and cholesterol if they were dumped directly into the blood. To solve this dilemma, the body transports fat and cholesterol by coating them with a water-soluble "bubble" of protein. This protein-fat bubble is called a lipoprotein. Low-density lipoproteins (LDLs) carry cholesterol to the tissues. This is "bad" cholesterol, since high LDL levels are linked to increased risk of heart disease. ·High-density lipoproteins (HDLs) carry excess cholesterol back to the liver, which processes and excretes the cholesterol. HDLs are "good" cholesterol; the more HDL you have, the lower your risk of developing heart disease. It makes sense to avoid high-cholesterol foods or those with saturated fats. These foods include eggs, whole milk and cream, coconut and palm oil, animal fat and organ meats, ice cream, cheese, and cakes and pastry. Monosaturated fats, such as olive oil and peanut oil, while touted as healthy alternatives, are actually only moderate in lowering LDL levels. As always, moderate your consumption of alcohol and quit smoking. Without concentrating anything, one should eye to find a permanent solution for the risky problems like cholesterol. They may find Naturopathy, Acupuncture and Yoga as their choices of treatment.